After waiting for one of the major brands to release the sort of Sauropod that I'd really like to see I have decided to have a go at one myself. This is my second attempt, the first was made using air dried clays which cures too quickly and does not allow enough time for the level of detail I was after. And the stuff cracks. Think I have found the right medium now with Polymer Clay, which stays workable for days until you bake it in the oven and then you can still add more clay to it and bake it some more. The image below is a work in progress, prior to the first bake hence the support for the extremities. The weight of the clay is a bit much for the wire armature at this stage, so it's a balancing act between stability and pliability. For my next trick I have to decide on a colour scheme, at the moment I am enjoying the monochromatic Invicta vibe of the base colour of the clay. If this goes well I intend to try and make a copy of the Battat Triceratops, as I am unlikely ever to own the genuine article! Lots of images online of it from differnet angles but does anyone know the dimensions? Or maybe I'll just pick a size. After that I'll have a go at a Moa, which I am not sure has been done by any company as yet (but don't quote me), having seen some fossils on our recent New Zealand trip. a fantastic piece of art, I very like his cute face! You should show it to Safari LTd. to produce it or you can make a form for him, to produce it in resin and sell a few duplicates of him! Fantastic work and idea! I am a great fan of sauropods,too and would be the first, to order a copy of him...!!! Hey, nice work Phil and an appropriate ammount of bulk..... Diamantinasaurus matildae? (I've got an armature laying around for this since months, but can't get goin' right now ) Did you use some paper maché or tape to save on clay and weight? Thanks for checkin' in and adding comments! Plesio: Don't think I'd go into mass production on this one, still feeling my way with the medium and though it turned out better than I expected it is still not where I see this going in terms of accuracy and quality. Lanthanotus: It has a wire armature padded out with scrunched up tin foil. As this stuff gets baked in the oven I wasn't sure about tape or paper so stuck with metal. Though the cardboard props went in with it and didn't burst into flames! Shaping the head, fattening the neck and trying to taper the tail out at a higher angle at the moment. Sits too low off the torso but nothing I can do about that now. Amazes me that this stuff still sticks to itself after the bake when you add more layers! More photos as I refine it further, and eventually throw some paint on it, as it were. Only able to work on it at weekends at the moment so slow progress, energy level and light level both too low of an evening. Hope everyone can see these images (shenanigans, I think is the technical term, at the hosting site). as shown below. More work done on the head, feet, tail base and neck. A bit more tweaking (another technical term) and a second bake then I'll probably look at painting it. Not perfect but it is only a first attempt with this medium. Like your first car - it gets all the scrapes and dings before you move onto a better one! 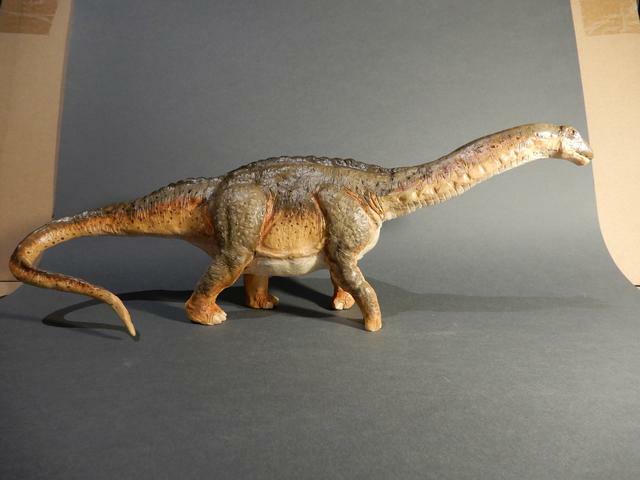 Think I'll go with the colour scheme used on the Sideshow Apatosaur, but not the white spots. Always makes me think that the poor beast upset a flock of pigeons! Looks awesome, that's a very very good first sculpt! I’m afraid I can’t see any pictures. Fortunately I can see all the new photos! 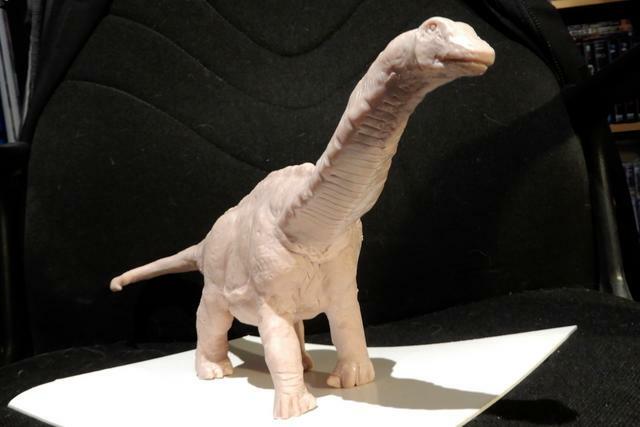 Your sauropod sculpt looks fantastic, I like its cute face very much! I can see them now! Very nice work. Thanks for the comments but I'm going to have to be my harshest critic and say that it's turned out a bit chunkier than I'd planned and rough around the edges but what drives you on with these things is the continual goal to realise what you see in your head out in the real world. One more bake then I'll try sanding back and streamling the back of the neck and the underside of the tail. Throw some paint at it after that and then move on to something else. As I can only work on it weekends this ain't over yet. Triceratops next, it's gonna be 'fun' trying to work out how to build an armature for the frill! Doug Watson has done the final word on this animal but I'd like to try and copy the Battat one, as I don't think I'll ever own the genuine article! That's the plan anyhow. That´s really not bad at all for a first attempt on sculpting! It´s all about getting used to the material first and experimenting with it. You seem to have a good feeling for the forms and transferring it into 3d. So keep on with this! I´m curious about the Triceratops. Getting the frill right is definitely a tough thing to do! Thanks for your input and words of encouragement. 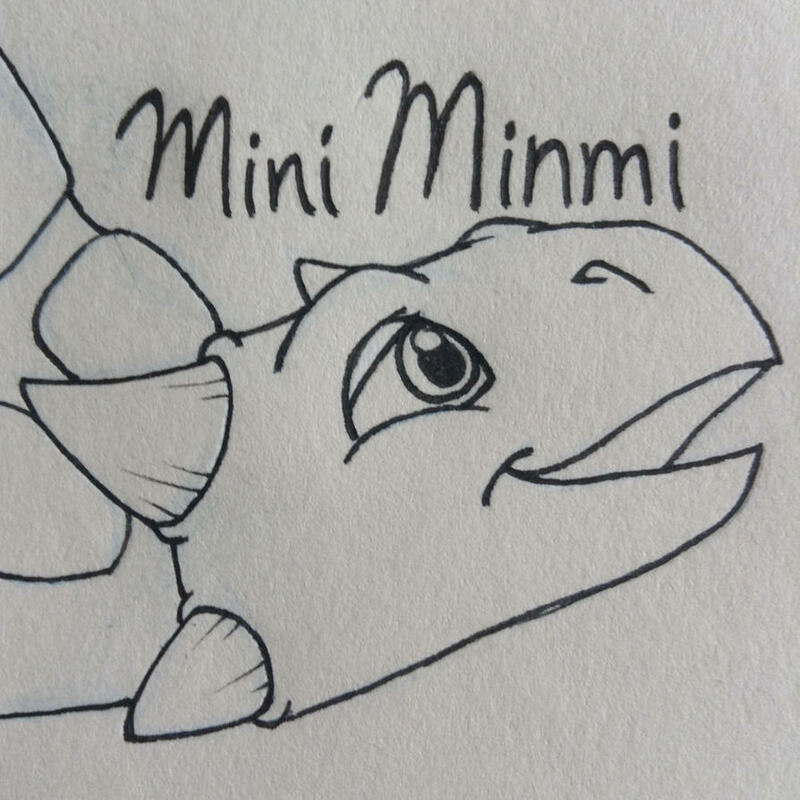 I really began this because I wasn't seeing this animal depicted in the mass market figures the way I thought it would look and have grown tired of waiting for that figure to be made. Always fascinates me how many interpretations arise from what is the same underlying source - the known fossil skeleton. 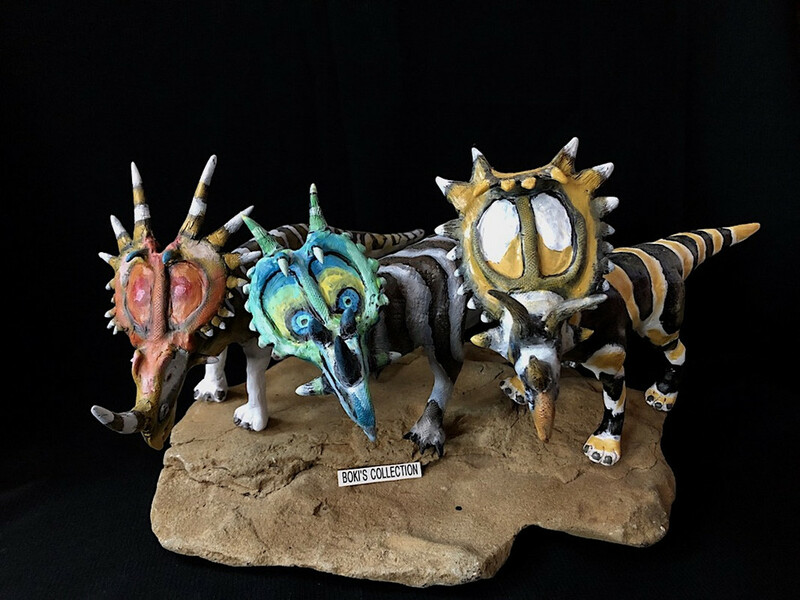 I like what you are doing and Kayakasaurus and am a fan of the work of Kazunari Araki and Forest Rogers - basically creators of figures that have a believably naturalistic and organic look to them. As I have said often I would love to have seen what Carnegie would have done with their update of the Apatosaurus in light of what they were doing with the other Sauropods prior to closing up shop. Now we'll never know. WOW, that is one impressive sauropod! Beautiful, with I had the talent to sculpt! That´s what I like so much about sculpting dinosaurs! They leave you enough artistic freedom to give them your own unique design. The skeleton is just the base you built upon. But in terms of soft tissue, coloration etc. you can pretty much do whatever you wish. Though I usually don´t try to stray to far from what seems to be scientifically possible or likely! And I like the work of Forest Rogers, too! He´s a very inspirational artist. Ever wondered what happened to the Apatosaur? - so Did I. I finally got back to it, gave it a bit of a reshape here and there, extended the tail, baked it again and finally got around to painting the thing (with some input from my wife). I was wondering about this little guy. It's lovely! I love the sort of speckles of colors on the sides, it makes for a very natural blending. I like his pose too, he looks so peaceful. Can't wait to see what you do next. Great job. You made a really nice first sculpt and the colors are lovely. How big is it?